First published in 1944, these speeches deserve study by contemporary students of leadership, media, and international relations. Written and delivered by the then Foreign Minister of the Czechoslovak government-in-exile, they were broadcast over BBC radio as part of the Allied media campaign against the Nazis during the Second World War. Listening to them was punishable by death under Hitler's regime. Yet untold thousands of Czechoslovak citizens regularly risked their lives on Wednesday evenings to hear Jan Masaryk. 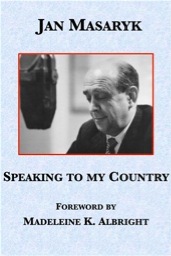 From September 1939 through the end of the war, Masaryk was one of the wittiest and most popular voices on the air, hosting a program called Volá Londýn (London Calling). He evoked Jan Hus and the Good Soldier Švejk, recited poetry, told jokes, provided eyewitness reports of the bombing of London, news of battles in Europe and Africa, and of public opinion in the United States. His extraordinary broadcast marking the Jewish New Year 5704, in September of 1943, includes one of the first explicit references by an international leader to the extermination of the Jews. Masaryk's broadcasts were so treasured that after the war, a Czech collection of the talks sold out its 60,000-copy printing, followed by similar success in London.